Multiplying Menace is now a Scholastic Book Clubs title. Look for it in a circular near you! Multiplying Menace is an Accelerated Reader title! Get the book that teaches multiplication concepts in a fun way! Attention Teachers! Here is an activity guide for Multiplying Menace. Enjoy! Podcast review from Open Wide, Look Inside: "Pam Calvert uses the age-old fairy tale of Rumpelstiltskin to tell a fascinating story involving multiplication of whole numbers and fractions. 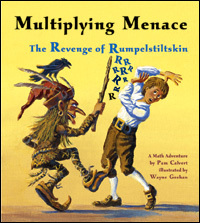 Multiplying Menace: The Revenge of Rumpelstiltskin provides students with concrete examples and simple explanations of multiplication that combines well with the 18th century illustrations and story." 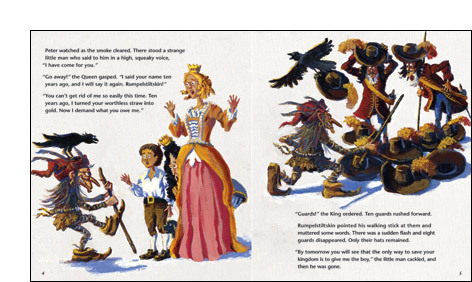 From School Library Journal--"Calvert has written an enjoyable teaching tool, and Geehan's luminous and expressive paintings are perfect for this fairy-tale world." From Treasure Family Magazine--"This clever adaptation will surely bring some excitement to your next math lesson." From Midwest Book Review--"Fun drawings enhance a fine story." From Veritas Press--"Students will be drawn in to a math adventure that is solved by, well, numbers." From Doc Kirby, radio reviewer on "Book Bit", WTBF--"It's a very clever way to teach multiplication!" From Glen Dromgoole, syndicated Texas columnist--"Also from Charlesbridge Publishing is Del Rio author Pam Calvert's wonderful retelling of the Rumpelstiltskin story, an effort that simultaneously teaches math concepts."